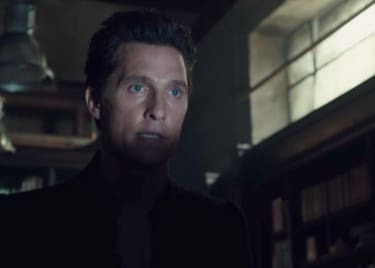 What started as a scary post in an online forum snowballed into an internet-crafted web of horror, and is now a major motion picture. Slender Man is a terrifying figure, with unnaturally elongated arms and facial features that appear to have been erased. He’s an internet fiction who has intruded on the real world in surprising and sometimes frightening ways. The film Slender Man, directed by Sylvain White, follows a group of friends played by Joey King, Julia Goldani Telles, and Jaz Sinclair as they investigate the mystery of Slender Man…only to become haunted themselves. Here are five things you should know before Slender Man opens on August 10. On June 8, 2009, Something Awful forum poster Eric Knudsen, using the pseudonym “Victor Surge,” posted two black-and-white photos of children at play, with a tall, faceless figure lurking in the background. The photos were an entry for a paranormal photo contest held by Something Awful. They were captioned with quotes supposedly from witnesses who had since gone missing. Knudsen said the “photographer” behind the first photo was presumed dead. The quote under the second claimed the photo was taken on a day known for fourteen children vanishing. The supposed photographer of the second photo, Mary Thomas, had been missing since June 13th, 1986. The mythos of the suited, child-abducting entity known as Slender Man (sometimes written as Slenderman) was born. Two weeks after the birth of Slender Man at Something Awful, Marble Hornets debuted online. The series follows film school friends Jay and Alex as they are stalked and attacked by Slender Man, referred to in the series as “The Operator.” Marble Hornets, widely regarded as one of the best ARGs (alternate reality games), is known for its frightening use of video distortion, lo-fi realism, and the unique way the audience was able to work with the protagonists in order to figure out what was going on. Marble Hornets ran for five years, from 2009-2014, with 92 episodes and 39 accompanying videos from a side-channel, “totheark.” As of May 2018, the main channel has over 96 million views and the videos are available as a DVD box set. In 2015, a VOD film spinoff Always Watching: A Marble Hornets Story, starring Doug Jones as Slender Man, was released to negative reviews. In 2012, writer and producer Mark J. Hadley released Slender: The Eight Pages, an indie freeware first-person survival horror game. Players explore a forest at night, with only a flashlight for protection. Though the gameplay is limited and the graphics are minimal at best, the game is nothing short of terrifying. In the otherwise quiet game, Slender Man will appear suddenly, accompanied by a loud piano-slamming noise and/or static on the screen. The “game over” screen (which players will see often) is a close up of Slender Man’s face with blinking static pulses. In 2015, Slender: The Arrival, developed by Blue Isle Studios, was released in 2015 for PlaysStation 4 and Xbox One. 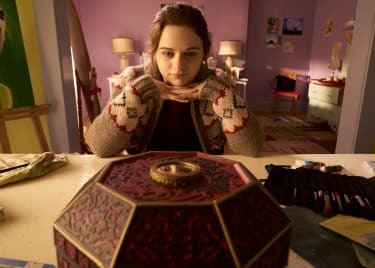 Following a survival horror format similar to its predecessor, The Arrival follows Lauren, a young girl who is searching for her best friend Kate. It takes place in abandoned areas, each with their own set of objectives. When Slender Man appears, the screen will glitch and distort—and coming too close to him will result in the player’s death. In 2014, in Waukesha, Wisconsin, two 12-year-old girls lured their friend into the woods and stabbed her 19 times. The girls had discovered Slender Man via Creepypasta, a website that hosts fictional horror stories. Later, they said they had believed Slender Man to be real. Using the lore as their guide, the girls decided they had to “prove their loyalty” to impress him. The only way to do this was to kill someone. Fortunately, their victim survived. The Creepypasta Wiki was blocked throughout the Waukesha School District, but this did not stop members of the creepypasta community from holding a 24-hour live stream on Youtube in order to raise money for the victim. HBO Films released documentary about the incident, called Beware the Slenderman, in 2016. The 6’7 actor is no stranger to playing scary monsters. Botet was born with a rare condition called Marfan syndrome, which has given him extremely long fingers and a tall, thin build—and a career in horror. Botet played the title character in 2013’s Mama, the Crooked Man in The Conjuring 2, and the grotesque leper that haunts Jack Dylan Grazer’s Eddie in 2017’s IT. Now he gets another title role, and it may be his most intimidating one yet. 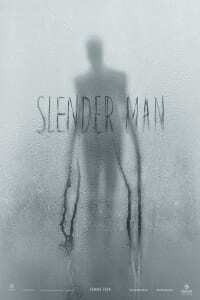 Catch Slender Man in theaters on August 10.